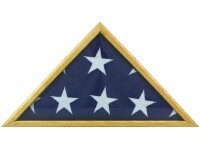 Beautifully Crafted using Top Grade Cherry WoodBeveled Glass Front with Imprinted Gold SealMagnetic Front ClosureFits 5' x 9-1/2' Flag (typical memorial flag size placed over a casket)Flag is not incl.. 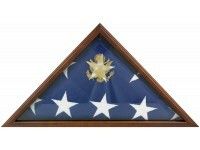 Beautifully Crafted using Top Grade Oak WoodGlass FrontFits 5' x 9-1/2' Flag (typical memorial flag size placed over a casket)Flag is not included in price.. 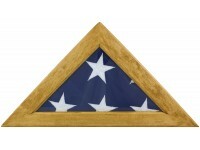 Beautifully Crafted using Top Grade Maple WoodPlexiglass FrontFits 5' x 9-1/2' Flag (typical memorial flag size placed over a casket)Flag is not included in price.. 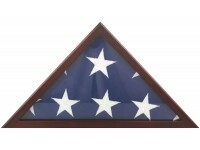 Beautifully Crafted using Top Grade Poplar Wood with Cherry FinishGlass FrontFits 5' x 9-1/2' Flag (typical memorial flag size placed over a casket)Flag is not included in price.. 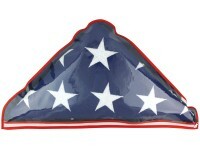 Protective Heavy Clear PlasticZipper ClosureFits 5' x 9-1/2' Flag (typical memorial flag size placed over a casket)Flag is not included in price.. 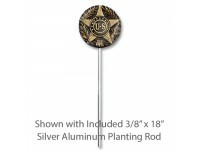 Durable Thermoplastic EmblemPermanently Antiqued and Highlighted in BronzeClear Protective Over CoatingSupplied Complete with 3/8in x 18in Aluminum Rod for Easy Ground Planting..